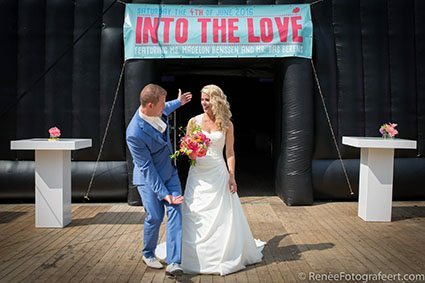 Bas and Madelon’s real summer wedding in the blow-up church in Hoevelaken, Holland was a stylish affair. 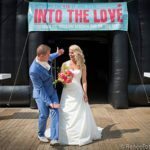 And hosted on Bas’s family run farm, the inflatable venue played a unique part during the young couple’s festival-themed wedding. 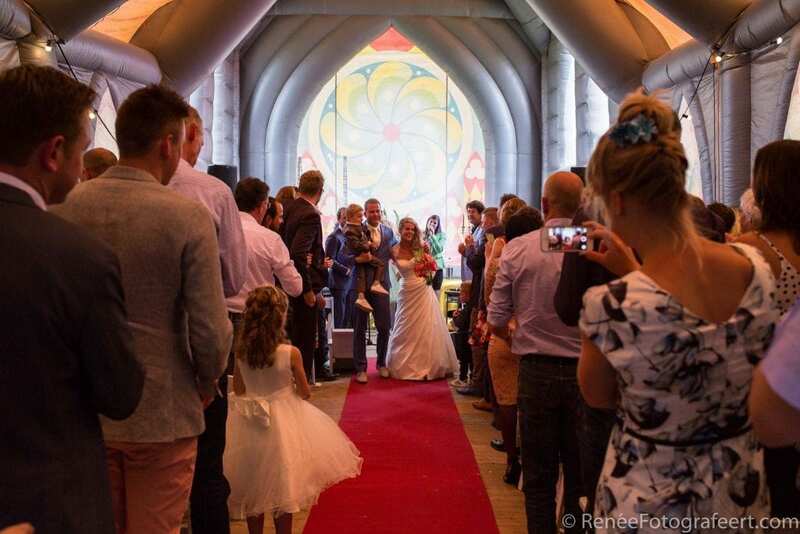 Even more exciting, the air-filled church is the newest venue trend to hit the wedding scene. The exclusive event hall offers the highest quality sound & lighting, a dance floor and a bar. 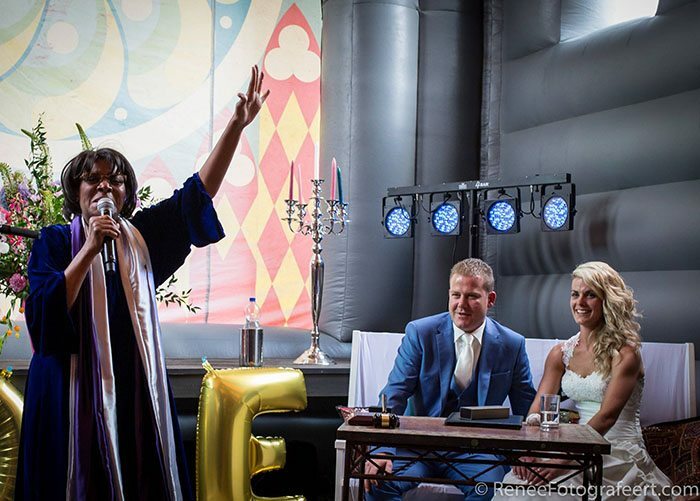 So, Bas and Madelon were guaranteed an awesome event location to host their wedding. Basically, their big day was a summer festival wedding extravaganza of the year. The Dutch couple live and work in Hoevelaken. And they are music festival lovers and travel buddies. What’s more, in their spare time they enjoy walking their dog. Continue reading the real wedding of Bas and Madelon in the blow-up church. The grey blow-up church, a jumbo sized air-filled gazebo stood against the backdrop of the beautiful acres of farm land. With the weather predicted to be sunny skies, high winds and blustery rains it was the perfect setup for a festival wedding. 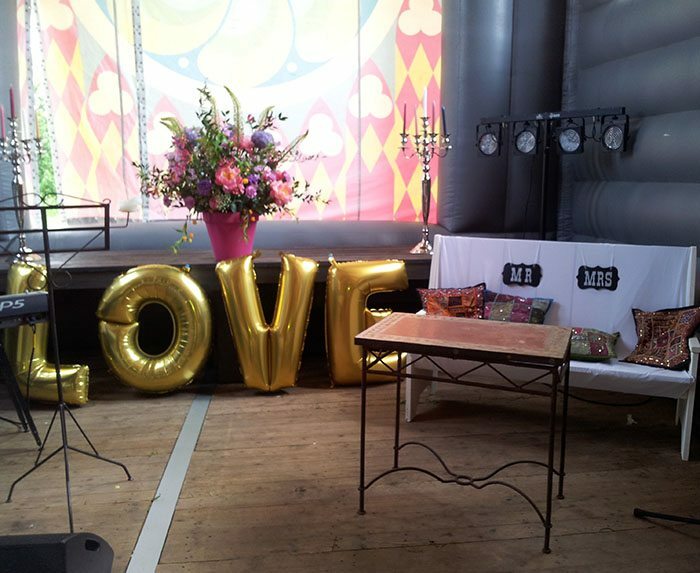 The alternative party tent with a wedding throne offered a traditional yet modern feel to the nuptials. Basically, Bas searched all over the internet for my wedding services. We finally caught up via the phone and he, I and Madelon got together to discuss their vision of the wedding day. We met on Sunday afternoon at the De Jaren Café, Amsterdam. It was a fruitful chat about having a traditional wedding with a modern day British-Caribbean celebrant twist. The happy couple obtained their marriage license beforehand. So, we got to work with composing their love story. We revised many drafts. Bas and Madelon felt it was important to include special family members during the ceremony. And together we created an entertainingly heartfelt speech with personalized wedding vows. Adorned with the words Mr. and Mrs, the makeshift wedding throne awaited the lovebirds. As the bride entered to the band playing their signature tune. Bas stood nervously with me at the altar in preparation for the reading of their speech. It was a stunningly romantic moment. Madelon uttered her personal vows from the heart. Suddenly the weather gods arrived. And as Bas sung his vows to Madelon the winds took hold of the blow-up church and detached one side. Fixed within minutes, we were able to return inside to witness them say, “YES, we do”, embrace and kiss one another. To conclude the ring bearer Bas’s nephew came forward to present the precious circles of love. As oohs and aahs rang out throughout, Bas and Madelon lovingly exchanged rings. Followed by the signing of the symbolic certificate by them and their witnesses. Finally, I marked the momentous event with a ceremonial mallet. It was the perfect ending to an exciting festival wedding. We are truly grateful to you for your help during our ceremony and especially for being a wonderful wedding celebrant.